Peter Arno, who was born Curtis Arnoux Peters Jr., the son of a New York State Supreme Court judge, was educated at the Hotchkiss School and Yale University. 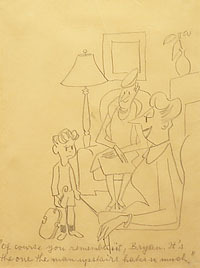 When he joined the staff of The New Yorker magazine in 1925, he adopted the pen name “Peter Arno.” He drew cartoons and covers for The New Yorker until 1968, the year of his death. He was one of a handful of writers and artists who helped define the magazine’s sophisticated style and humor. In all, he created 99 covers and many more cartoons for the magazine. This one is typical of his style and his wit. Of course you remember it, Bryan. It’s the one the man upstairs hates so much.